After meeting the team behind Type the Hype at a blogger event late last year, I thought everyone was so lovely and welcoming that I rushed to sign up to the newly-launched platform. It wasn't until very recently, however, that I was accepted for my first assignment - a luxury haircare campaign. Not wanting to sound spoiled, I was a little disappointed when I first received these. I thought these are exactly the type of samples(*) I get to pick up for free at my local salon. As I only received single-use packs, I cannot give a full review past first impressions. However, believe me when I say these samples left a very positive first impression. Even before trying this new range, Redken was already one of my favorite salon brands. Promising to strengthen distressed hair, this fortifying Redken range lead to a 73% reduction in hair breakage. 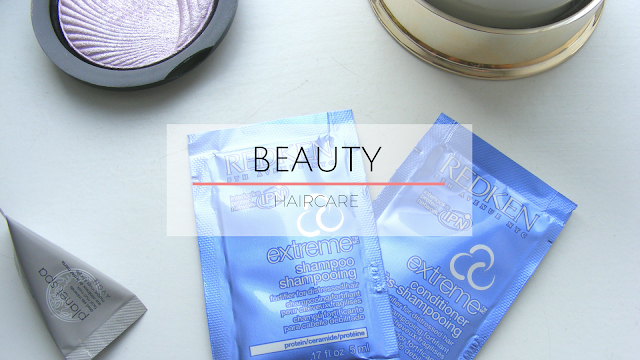 The Extreme range contains a new and exclusive Interlock Protein Network (IPN) and Redken's own Fortifying Complex to help deliver targeted care to damaged hair and intense conditioning that lasts. Suffering from brittle hair due to the cold weather, one application was enough to leave my hair feeling a lot stronger and smoother, even taking into account any heat damage I might have caused when styling it. After feeling the difference a good shampoo and conditioner range can make to my hair, it will definitely be hard resisting the urge to pick up a full-size set (or two) at my next salon visit.